In today’s marketplace it is crucial to have a brand identity and an online presence, particularly for a creative professional. Jon Vernon needed to create an online portfolio in order to have a branded presentation of his work to deliver to potential employers. 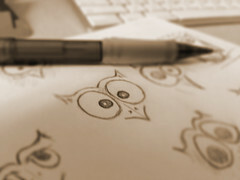 For the logo design, the emphasis was placed on the designer’s signature. This gave the logo a humanistic nature and helped to tie the logo to the person. Once the logo was designed, a user experience wireframe was created in order to deliver the information in a succinct, yet easily-digestible, manner.